First it was the Wellywood sign, now it’s a statue of a guy standing in a giant pile of manure while holding aloft a golden testicle. And you thought the only Mayor that delighted it making their constituency look stupid was Tim Shadbolt. Please, please Wellington. Vote her out. Actually the guy is being sucked down, and has ripped out his testicle in a despairing last effort to offer his heritage to any takers. Like, we don’t. Soccer maybe, and more cultural stuff. You must be muddling us up with Lower Hutt. Don’t they play League there? “The statue depicts players jumping in a line out and was a “celebration of the pursuit of the ball”. captcha: artist – how does it do that? Kerry and her team have made wellington a wonderful place to live. if we had a better climate it would be the best place. when i compare how wellington feels as a city, to how dunedin feels, and look at the state of the two economies, you can see why wellingtonians vote her in repeatedly. that and the fact the competition is rubbish. The changes you’re thinking of where largely made under Fran Wilde. All Prendergast has done is turn parks into concrete jungles. She gets in because there are too many left candidates and too few good ones. Make up your minds. Please. and it’s also a nice place to live. it has a vibrant arts scene, it’s a cultural capital and has the best nightlife in the country. it’s a pity it’s sports teams, with a couple of notable exceptions are so rubbish. wellington has benefited from billions spent of wastrel public servants sunning themselves in midland park, but there are plenty of other reasons for it’s success. how is turning that godawful dump that used to be carpark into an inviting open space called waitangi park turning parkland into concrete jungle BR? and what about the improvements to the waterfront? another carpark turned into a public space right by the NZX. Speaking of capitals, TR, how about you use some? It diminishes your contributions when they appear to be written by an obsessive ee cummings fan. Mind you, TVOR, not as bad as phil u, who unlike TR is on our side (most of the time, although he does become obsessive about carnivores) but does the ee cummings ellipses as well as the compulsory lower case. And what about the improvements to the waterfront? …. largely against the resistance of Her Lordship The Mayor, who was in favour of Wellington Waterfront using the Waitangi Park land to build apartments, promoted the Hilton on the Outer T and who has solidly backed Variation 11 to make it easier for developers to get their way on the northern end of the waterfront. In spite of Kerry Prendergast, TR, not because of. 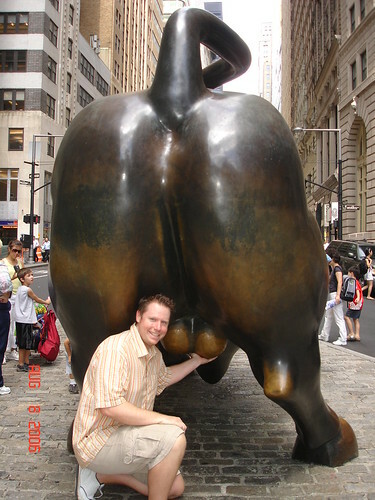 a statue of a guy standing in a giant pile of manure while holding aloft a golden testicle. You have to admit, there’s a certain way in which this describes modern NZ pretty accurately. Lew, I believe it was the working title for John Mulgan’s second novel. Whoa there, Toad! Its your mayor – don’t blame us bogans for your electoral disasters. And our Mr Guppy would never descend to that typical latte-sucking,Wellingtonian pseudish description of a lineout..
Not mine – I’m a Westie. Thanks Lew. That was enjoyable. You can tell it wasn’t made in Auckland, there’s no Andy Haden diving out sideways. That’s grossly unfair, IB. You’ve overlooked the sterling efforts of one M Laws, who manages to make his constituency look stupid by the mere act of having voted for him, then bravely goes on radio every day to remind the rest of the nation just how stupid the good burghurs of Wong-aye-new-ee must be. Fair call, I thought about Laws and decided he didn’t have the self-reflexivity to realise what he’s doing let alone delight in it. I think George Lucas might issue copyright infringement notice on that statue design..
Actually, I think it’s nicked from the marines’ memorial, which was based on the famous photo of the flag being raised on Iwa Jima. Pathetic. Wheres the space on the statue for Rexy to develop “D” grade flats? from a professional point of view this is not a successful design. it has many negative elements, not the least being a pricetag the city cannot afford. it is clumsy, shallow and would be far more suited to a war memorial than a sporting triumph. If they’re going to have a statue then it really should be one of John! We haven’t seen enough of him lately. Or Helen just to really outrage people. Since Key wants to turn NZ into a financial back door hub, how about this as our statue ? The sculpture proposal is clumsy and inarticulate wellywoodyness. the problem isn’t the statue (tho can’t say I care for it personally) but the price tag. As a Wgtn ratepayer I really find it outrageous. There are community projects being cut for want of much smaller sums.